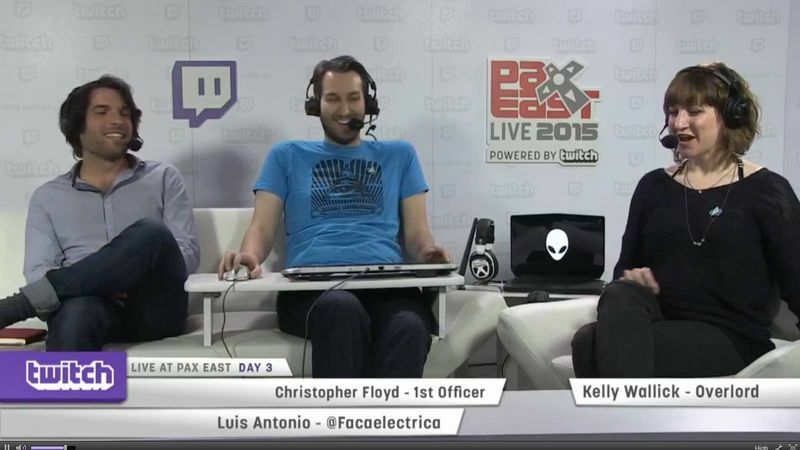 PAX East 2015 – How did it go? 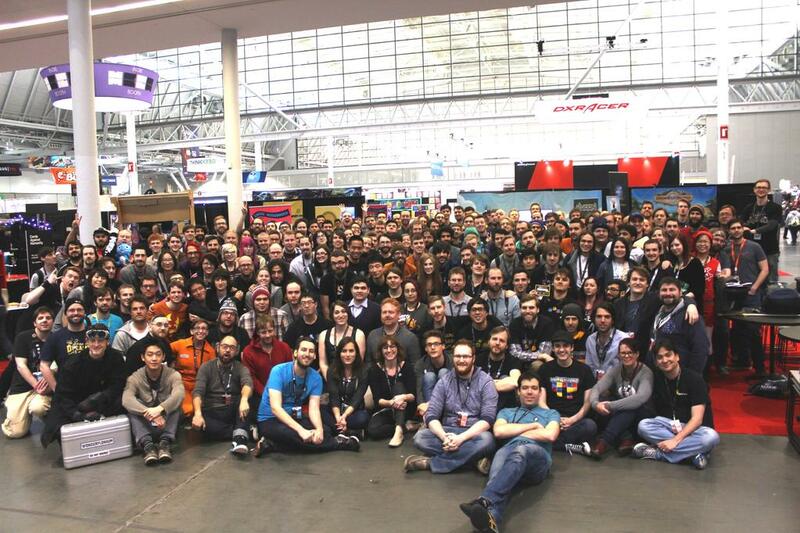 Home / Uncategorized / PAX East 2015 – How did it go? PAX East has just ended and as I return to San Francisco, before I forget anything, I feel its a great time to go over the whole event. I would suggest reading Willy Chyr’s (RELATIVITY) PAX East 2014 post-mortem, it helped me prepare and I won’t cover stuff that he already went over. Twelve Minutes version at PAX had the full story and core content but art, animation, audio and dialogues were placeholder (I will be improved once I move into actual production). 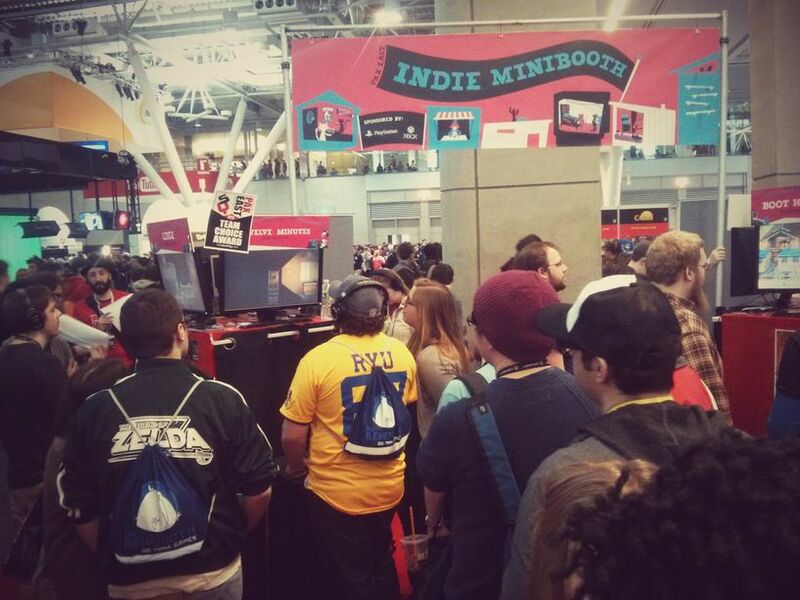 This meant that the Indie MINIBOOTH was the perfect testing ground, an affordable way to have your game exposed to many gamers at once. I was alone presenting Twelve Minutes so I couldn’t leave the booth unattended. The Indie MEGABOOTH organizers and volunteers were impeccable, they provided me with water, food and helped out if I had to leave the booth for any reason. 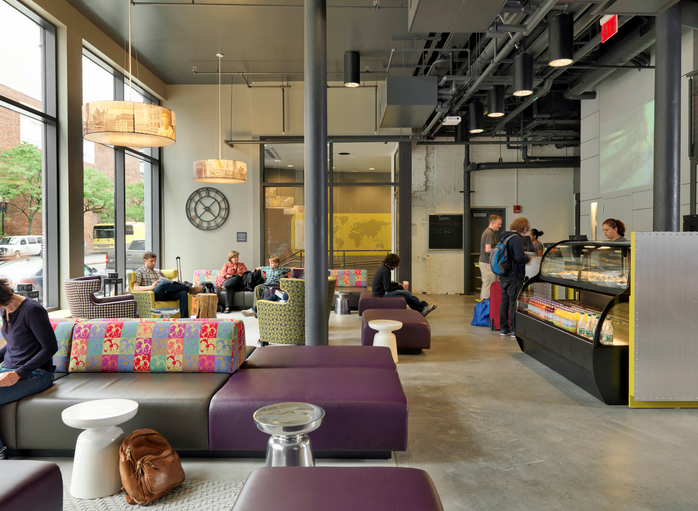 In terms of accommodations, I decided to stay at the Boston Hi- Hostel. It’s at walking distance from the Convention Center, allowing me to do a morning walk before standing up for 8 hours. There were other devs staying there and almost everyone else was an attendee. The Hostel has big windows and a nice fireplace, creating an inviting mood to chill out, drink tea and do some work if needed. I also used this opportunity to hang out with other fellow developers. We all shared a common goal: a huge love for games and a desire to convey messages through this unique medium. Taking the time to connect, learn from their experiences and have feedback on your game was very important for me. 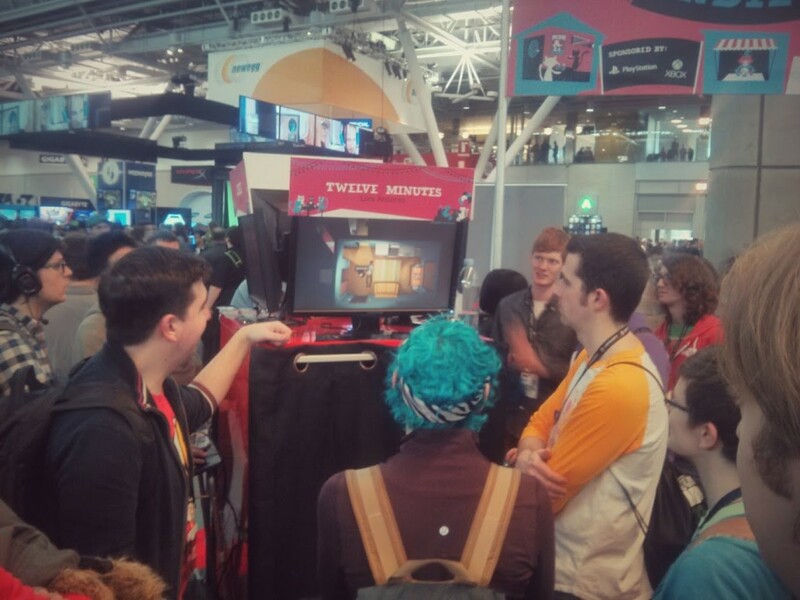 PAX is the perfect place to understand how the public will react to your game, attendees would stop and look at the monitor, trying to know what the game was about. They were intrigued by the top down view and the lack of immediate action but without any explanation they wouldn’t try it. If someone was clearly interested I would approach them and explain the concept. ME: “This is a game about a man trapped in a time loop”. At this point people would smile and get curious about the whole thing. At this moment, everything would click and the smile would get bigger. If the cop was beating up whoever was playing the game, they would be clearly excited to try it out. I realized that the fact that everything is in real time was a big contrast to the classical adventure games. People enjoyed the fact that when you ‘Skip’ a dialog line you would actually speed up time to the end of it so you can’t be faster by clicking through dialogues. Most people assumed that once you knock out the cop the game would be over so I wanted to make it clear that there is a LOT more to the experience. At this point people would want to try it out. I decided to let people play for as long as they wanted, allowing me to see what works or not. 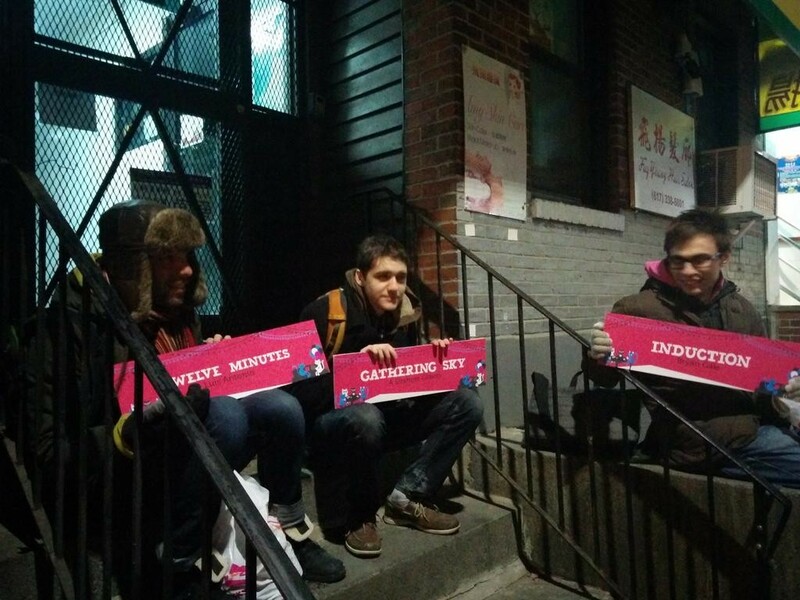 In average people would play from 30 to 45 minutes, but what surprised me the most, was some attendees waiting over an hour to try it out. Having people play your game at this sort of event is very different from a Q.A. department. No one is being paid to do it and you are literally surrounded by many other games, all screaming for attention. This means, that if someone decides to give you 45 minutes of their time, you might be on to something. 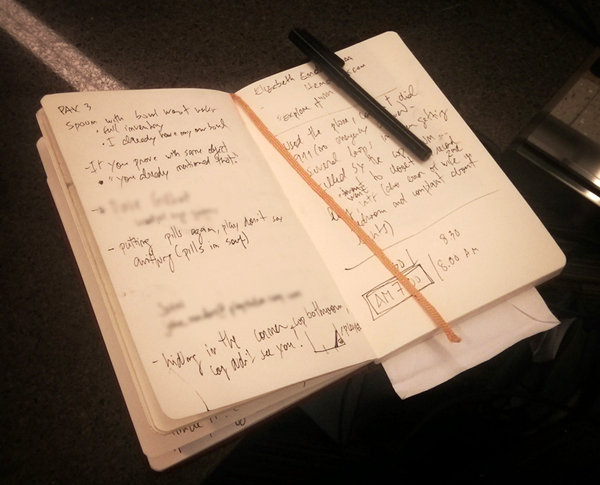 I made sure to always have my notebook with me, take notes, and if time permitted, talk with the people about the experience. At the end of the first day I had 4 pages of feedback. Once the expo floor was closed, I would go back to the hostel, prioritize the list and fix as much as I could until I was too tired to be productive. By day 2 I only had a couple of pages with minor issues. The prototype played all day long without any crashes or game stopping bugs. A few weeks before the event we were given a list of all the press members that would attend. I tried to email the ones I believed would be interested in the game, but being a relatively new project, I didn’t get that many replies, so I made sure that if I recognized someone I would try to at least tell them what the game was about. Folks at @giantbomb now discussing one of my fav @indiecade 2014 sneak peeks named "12 minutes". Seriously amazing game. @PetariJ 12 Minutes (Indie Mini Booth), Deathstate (also in the mini booth) and Kwaan all had some fresh ideas. This meant that on the second day I started to have a line at the booth and people specifically looking for it. By the end of the second day I got an award from Sidequesting.com and previous players returning with their friends saying “You gotta try this game!”. I also got a couple of people telling me “This was my favorite game at PAX!”, which, after three days of crappy food and back pain meant a lot! At the end of the second day I was again mentioned at a panel. This time it was Greg Miller from Kinda Funny. This brought even more people on the last day which ended with a great tweet from Polygon‘s Samit Sarkar. There are less than 2 hours of #PAX left. My recommendations: Devolver for Not A Hero and the Indie Minibooth for Twelve Minutes. Go go go! Overall, I couldn’t have asked for more. I feel the public and press enjoyed the premise and wanted to learn more. 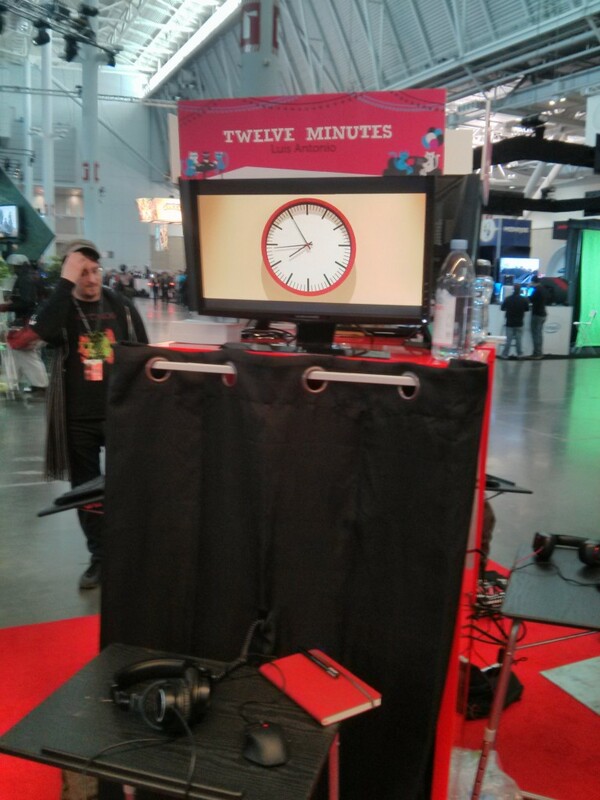 PAX East allowed me to understand Twelve Minutes from a fresh perspective. What I believed worked very well turned out to need change, while other things that I had been worried about ended up not being a problem at all. Having this sort of feedback at this early stage will allow me to fix core issues that would be impossible once I go into full production. Avoid doing major changes to your build the day before! Make sure your game is self explanatory. People should be able to learn how to play it without having you explain it. Make sure that you have something on the screen that captures the attention/imagination of the players when someone is not playing the game. Don’t force people to play your game, this will just scare them away. If they stop and show interest then its probably a good time to approach them and tell them about it. Bring water and snacks. You WILL need them! Try to know who-is-who from the press and any other outlets that you respect and like the themes of your game. Nothing is worst than having them pass right by you and miss your game. Make sure to hangout with fellow developers, there is a lot you can learn from them. Amazing representation, looks like you were a total hit. Thanks for the insights and good luck! Easily the highlight of the show for me definitely was playing Twelve Minutes. It only took until the final hour of the show to find it in the indie mini-booth though, it was facing facing inwards.with nothing but the sign outside the booth to denote it’s presence.